Truth be told, my first pencil portraits were of CCM artists back in the mid 90s. Artists like DC Talk and PFR were frequent subjects as I tried to figure out my way around drawing faces (they’re quite embarrassing to look at today). 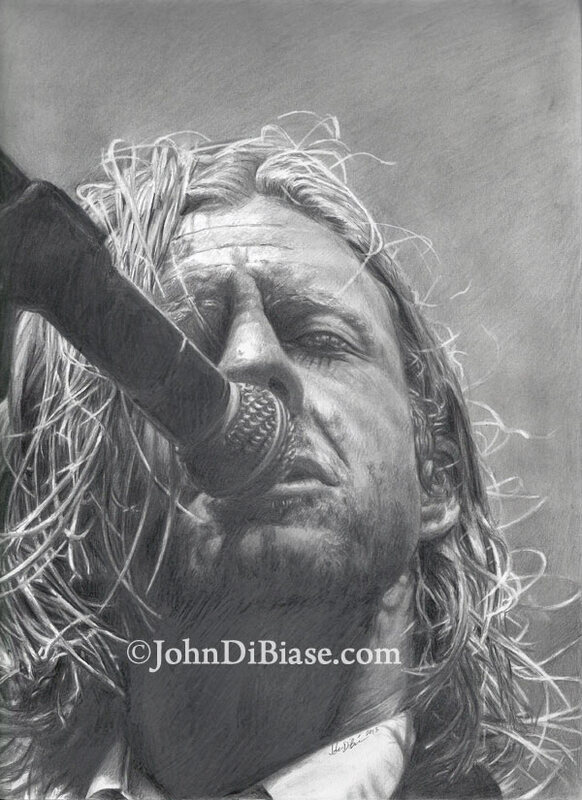 Back around 2000 I did a drawing of Jon Foreman as I’ve actually been a fan of his band Switchfoot since 1997 when their debut album The Legend of Chin came out. In 2010, I drew my first live concert photo drawing from a photograph I took of Mac Powell of Third Day. I recently thought it might be cool to give another one a try, and the source photo for this drawing was taken by me in September of last year at Uprise Festival. As with all of my drawings, I tackled this one freehand — just eyeballing the photo and trying to replicate it with a pencil on a piece of paper nearby — with no measuring, tracing, or grid involved. This one was worked on from September 3 – September 10, 2013. Just scanning through the thumbnails and I thought for sure this was a black and white photo. Thanks man! I actually took the photo that i used to freehand draw this from. but this is definitely a drawing. 🙂 thanks for checking it out!